The Ashton Cabinet VSG Enchantment cigar is a dark, hefty perfecto. A medium-bodied work of art. 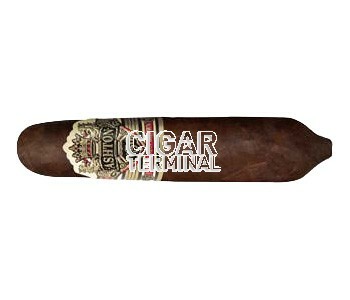 This fine cigar's superb draw makes for a pleasing easy burn. The Ashton Cabinet VSG Enchantment cigar is a dark, hefty perfecto. A medium-bodied work of art. This fine cigar's superb draw makes for a pleasing easy burn. Premium construction along with coffee, cedar flavors, spice notes, and a hint of vanilla on the finish. A highly sought after rare cigar.